I walked into our living room a few nights ago and my daughter was watching Miracle which is the Hollywood version of the United States’ hockey team winning the Olympic Gold Medal at the 1980 games in Lake Placid, New York. I had stuff to do, but I made the mistake of sitting down and got hooked. I had seen the movie before and remembered the actual event (I even think I had saved the Sports Illustrated magazine that came out after the win). My daughter did not notice, but it struck me that this would make it into a movie made fifteen years after the Soviets left the war-torn country. I am guessing that the protest of the Afghan war in the movie was more about the United States fighting there when the movie was filmed. Leave it to Hollywood to never miss an opportunity to bash America. It is funny how an innocuous placard held by a “fan” in a movie made me read an article in my local paper. It was about the Afghanistan War and I probably would not have read it except for that movie. The headline; “Troops seethe at battle limits” and is about how General Petraeus plans to win the war while keeping civilians safe. That sounds like a worthy plan, however, many feel that the “Rules of Engagement” put our own men at serious risk. There seems to be a chink in the strategy given we are trying to avoid civilian casualties. Our enemies have made a habit of hiding within the civilian population, and they know that we are trying to avoid killing civilians. Our enemies have no uniform so the naturally blend in with the local populations and they have used this to their advantage. If you read reports about our casualties, soldiers seem more likely to be killed by a roadside bomb than in a traditional engagement with the enemy. The Taliban does not seem to share the concern for Afghan civilians. Another article provides statistics that the attacks by Taliban has spike this year and they are responsible for over 60 percent of civilian deaths. Apparently there is an agency called the Afghan Rights Monitor who urge continued restraint by the U.S. military. They express concern that a policy change will endanger more civilians even at the cost of our soldiers. Maybe our fighting men and women need a Soldiers Rights Monitor? 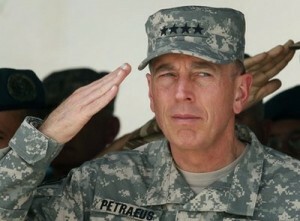 August 6, 2010 Update – many on the conservative side breathed a cautious sigh of relief when General David Petraeus was placed in charge of the NATO war effort in Afghanistan. Not many criticized his predecessor, General Stanley McChrystal, but there were grumbles about how he handcuffed his troops through tight rules of engagement as discussed in the original post. Patraeus was seen as perhaps more of a warrior who would take the gloves off and permit our soldiers to do what soldiers do in war…kill the enemy and break things. To many Patraeus was Patton. As expected General Patraeus did modify the complex rules of engagement in Afghanistan. He actually made them even more stringent in an attempt to win the support of the Afghan people. It sounds like a reasonable concept to try to limit civilian casualties, though most wars and battles that we have won in the past have either purposefully or incidentally killed many as we fought against our enemies. It must be a thankless job for Patraeus to have to try to win this battle in a country where folks seem used to this type of action. Try to imagine sitting at home while a furious gun battle erupts one hundred yards away. Try to imagine what it must be like when half of those engaged are dressed just like you and make it a point to hide with you when things get too hot in the battle. Severely restricting the rules of engagement puts our soldiers at greater risk to protect civilians. Publishing our rules of engagement so the enemy can exploit them puts our soldiers at greater risk. As more and more of our fighting men and women pay their last full measure in this war I have to ask whether it is worth it? 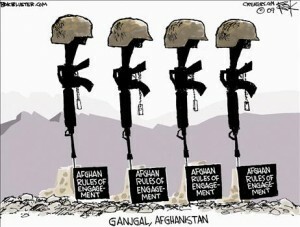 We seem to be winning the hearts of the politicians in Afghanistan, but will lose the war. Is it now time to stop? This article was published on Jul 14, 2010 . It is tagged afghanistan, bomb, civilians, lake placid, olympic, risk, rules of engagement, russians, soldiers, taliban, troops, united states. You can follow any responses to this article through the comment RSS feed. Read General William Westmoreland’s memoires for some rules of engagement in Vietnam. I can only imagine. Seems like multiple killings of our soldiers every day.